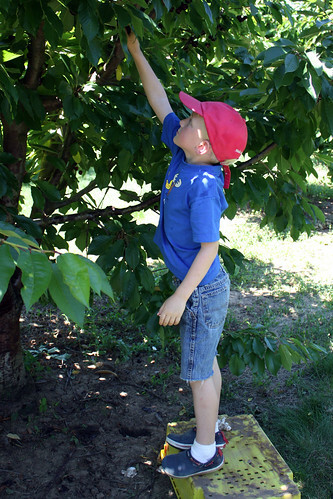 Yesterday we crossed another item off our summer fun list — fruit picking! I was a little nervous about taking both kids with me because I’ve never gone fruit-picking and I wasn’t sure what to expect. I had this vision in my head of being high up on a ladder while Augie took off at full speed through a dense orchard that stretched for miles. Hoping to head off a children-of-the-cherry-orchard scenario, I waited for a day when Augie was in day care and Wyatt and I took off for Brentwood on our own. 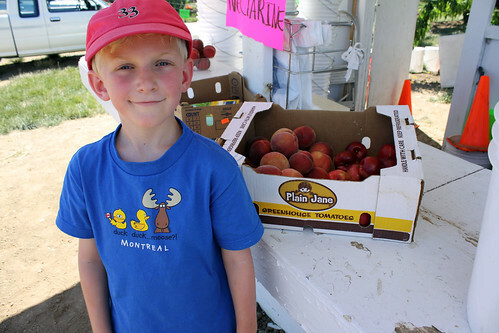 Brentwood is about an hour away from where we live and it’s the local hot spot for U-Pick fun. I brought a map of the orchards with me, along with a cooler and ice packs to keep the fruit cold on the long drive home, but other than that, I didn’t do much preparation. We headed to the general area where the farm stands are and then we just drove around until we saw signs for the fruit we wanted to pick. First stop: Peaches! I lovey love love peaches and I always sing that song by the Presidents of the United States when I’m even vaguely in the vicinity of them. Needless to say, Wyatt was begging me to stop by the end of the day, but alas! I am powerless against a catchy tune about the world’s most magical fruit. 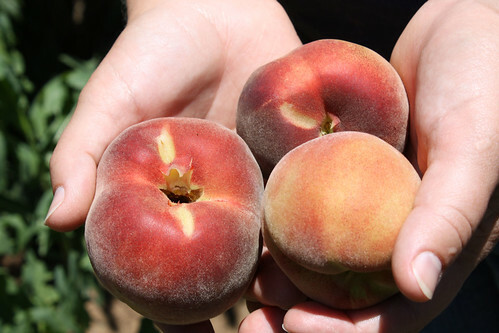 Anyhoo, we found a peach orchard pretty quickly and pulled in. The orchard wasn’t too big, the trees were far apart and we didn’t even need to stand on ladders to pick the fruit. I easily could have managed both kids there by myself, so next time I go I’ll bring Augie too. Wyatt and I picked white peaches and some nectarines too, then we drove down the road a bit further in search of my true goal for the day: cherries! 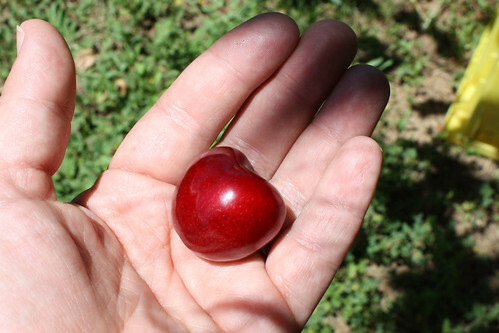 There are cherry orchards everywhere in Brentwood so we didn’t have to go far to find what we were looking for. The orchard we stopped in had both white and red sweet cherries. 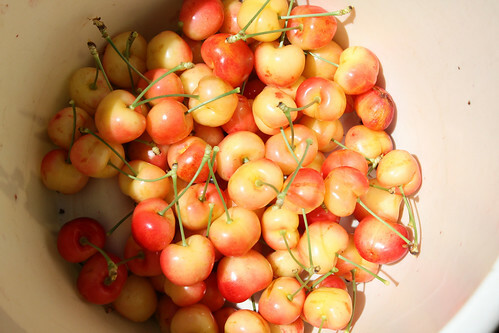 We started by filling our bucket with a hefty layer of Ranier cherries, then we moved on to the red cherries. 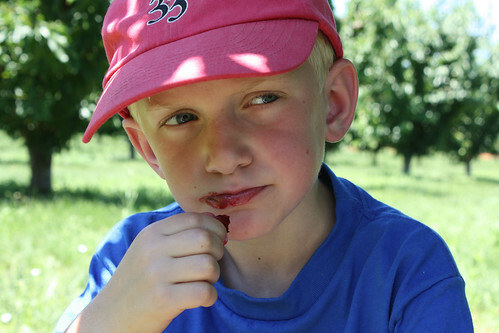 I found cherry picking to be really fun and Wyatt liked it a lot too. Pretty much all the fruit we saw was ripe and again, I didn’t need to stand on ladders to get to it. Wyatt could reach plenty as well but he liked standing on boxes so we sought them out. 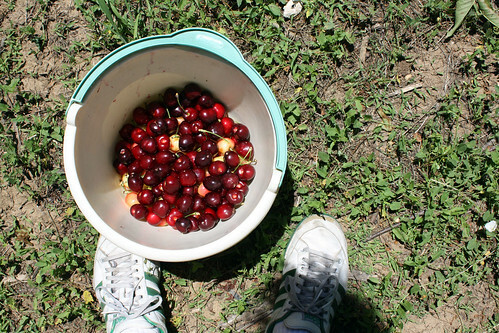 The red cherries we picked were Bing and Utah Giants. When they say the Utah Giants are giant, they’re not kidding! Wyatt probably ate as many as he picked. After awhile I gave up on trying to stop him. I felt pretty guilty about it so I told the guy about it when we paid, but he just laughed at me when I offered to pay a little extra. 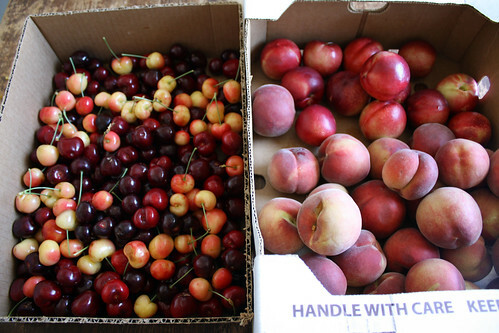 Here was our final haul: six pounds of cherries and eleven pounds of peaches and nectarines! 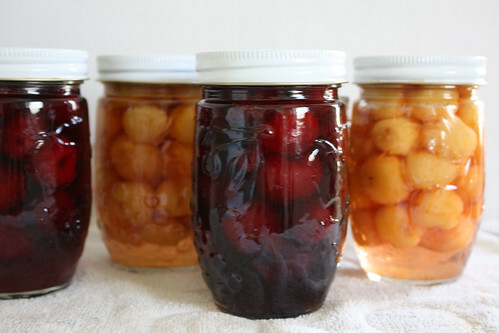 I got busy right away when we got home and put up some of the cherries using this recipe from Simple Bites. I made a peach crisp using my crisp in a jar recipe as a basis, but I didn’t get any pictures of that because we ate it so quickly. 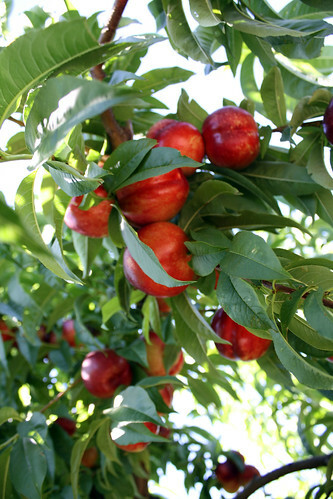 Have you ever gone fruit picking? What’s good in your area right now?